Come sit and relax while Karen share's her tips for both hand and machine applique. Karen will discuss the items she uses to make it easy to achieve good results. She will also share some of her organizational tips. Being organized allows you to finish more projects. After sharing the items she uses and her organization tips via Power Point, Karen will then demonstrate numerous applique tips including how to achieve smooth curves, sharp points and perfect circles. Karen will use her camera and projector when demonstrating so no matter where you sit in the room you'll have a great view. All you need to bring is a some note taking items...paper and pencil. (6 hours) – This wonderful wall quilt is paper pieced and machine appliquéd. You will be thrilled at how sharp these skinny points will be and how quick and easy it is to machine appliqué these curves. 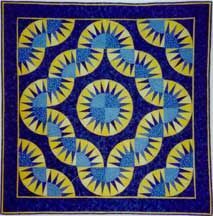 You will have several blocks completed in class with detailed instructions on how to finish your quilt top. You are going to love making this quilt.